FIRE IN THE MOUNTAINS Announces The First 3 Bands! Following its expansion in 2018, Wyoming-based outdoor metal gathering FIRE IN THE MOUNTAINS returns in 2019, with the largest lineup and gathering for the festival to date. 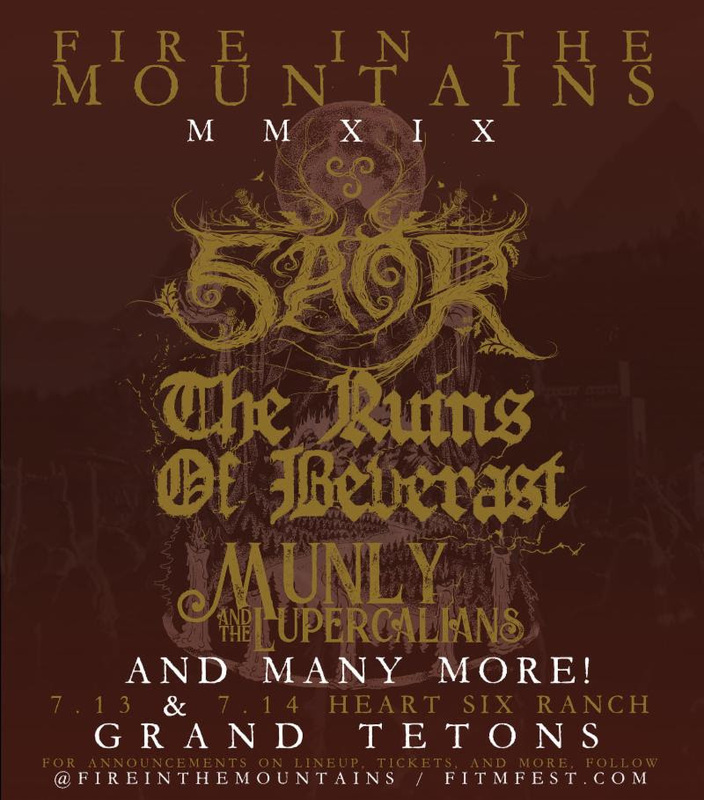 The promoters of the event have announced the first three bands for this year’s event, including The Ruins Of Beverast, Munly And The Lupercalians, and Saor. FIRE IN THE MOUNTAINS is a singular event, taking place in front of the Rocky Mountains’ crowning jewel, the Grand Tetons just outside of Jackson, Wyoming. Getting its start as a rogue one-off show in the wilderness, the FIRE IN THE MOUNTAINS festival is now a multi-day event showcasing the live performances of some carefully curated bands performing on an outdoor stage directly in front of the Tetons, as the sun sets behind them. It is two days of music, art, and revelry nestled deep in the beauty of nature, providing an escape from the trappings and monotony of modern civilization both through the music on display and through the beauty and isolation the atmosphere uniquely provides. Leading with a campfire pre-show on July 12th, the main events of FIRE IN THE MOUNTAINS 2019 are set to take place on July 13th and 14th. The first three bands confirmed to perform this year include a very rare US performance by entrancing German black/death/doom outfit The Ruins Of Beverast, the first-ever US performance by Scottish folk/black metal band Saor, as well as Colorado’s gothic country/Americana collective Munly And The Lupercalians, a new project of singer/songwriter Jay Munly. The fest will once again include camping at nearby Heart Six Ranch. Attendees can eat, drink, and camp on location and will also have access to sponsored hiking trips, whitewater rafting, backpacking, fishing, canoeing, horseback rides, and other outdoor activities during daytime hours preceding the musical performances in the evening. Tickets for FIRE IN THE MOUNTAINS will go on sale in mid-December, and the remaining acts in the fest’s diverse lineup will be announced in waves over the months ahead.